Artists Candice Smith Corby and Leslie Schomp are wearing multiple hats (visually dazzling ones, no doubt). 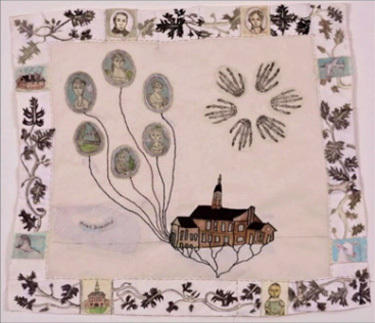 As they continue to create personally resonant mixed-media art, they’re also curators of Self/Fabricated, an intriguing exhibition of work by artists (including the curators, Jan Johnson, and others) who explore autobiography through cloth and stitching. The show opens at the Art Complex Museum in Duxbury on Sunday, September 23, 2012, reception 1:30-3:30 PM. Recently, they’ve added a “fundraiser” hat to the stack. Through June 1, the artists are using USA Projects to raise funds for an exhibition catalog. Here, they answer our cur8or eight questions with multi-talented aplomb. Explain the idea behind Self/Fabricated. Candice and Leslie: We have been close friends for awhile and around 4 yrs ago we were admiring each other’s work and how we would love to see it shown together sometime. We were imagining someone else curating us into their show – both of us wishing some magic curator would call us up. We were both using cloth and images of ourselves in our work, albeit quite differently, and we share similar loves of vintage fabric and old pastimes of stitching, ie. tea towels, table cloths, doilies, sampler’s etc. There was more to these tokens than just their practical use. 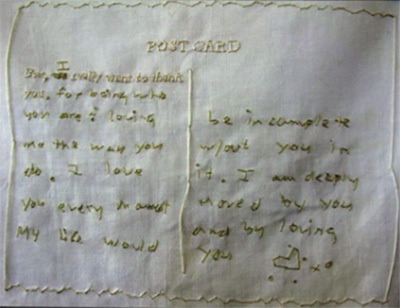 Each one told a story not just in the stains and physical wear but of course also in how they were marked, painted on and embroidered. There was an empathy for someone who had spent hours of both toil and enjoyment in the creation of these items. As both of us were married and mothers, we were also at the same time balancing domestic work, employment and work as artists. Once the lightbulb went off that we could organize our own show, the inclusion of the other artists, Jan Johnson, Ilona Anderson, Joetta Maue, Wylie Garcia Sopia, and David Curcio, happened pretty organically. Each artist wowed us with their return to stitching methods and reference of cloth as well as how they were attempting to identify, describe, or invent one’s one identity, life’s story or self through traditional and poetic self-portraiture. 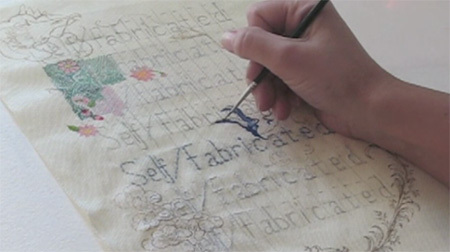 The word Fabricated is not just about cloth but also about how we create our own stories. Being a curator is like being a a) circus ringleader, b) high-wire performer, or c) driver of the clown car. Leslie: Being a curator feels to me like being a circus ringleader. What I love about our show is how varied the work is even though the artists identify so strongly with each other. Also the practical elements of being a curator; the various tasks and concerns are again so varied-from writing, business elements, laying out the space of the show, etc. Candice: I would say all of the above! I’ve found that I have to be the one in charge of complete chaos but act like I am completely unfrazzled with steady poise and also being open to spontaneous wacky ideas and personality quirks. What’s the most surprising response you’ve ever had to your work? Candice: When I was an undergrad, I made a pretty dramatic – overly dramatic – sculptural work with film and text influence by a dream and family memories. I was shocked by the emotive response and also saw the power that art can sometimes have. I think it also made me realize I wanted more joy and humor in my work one day. Leslie: This sounds kind of crazy but the most surprising response to my work was written in a guest book at a solo show I had. It said the work was “shockingly personal.” I suppose I was surprised because I always thought that the personal was obscured through lines, marks and veiled layering. Leslie: I can’t imagine how others see my life, but here are a few attempts (some serious and some a joke): A Life in Grey: the Quiet Years; or I Don’t Know! : the Leslie Schomp Story; or The Girl with the Last Name That is Like a Sound Effect. Candice: Most Improved, OR Easily Entertained. Share a surprise twist in the Leslie Schomp/Candice Smith Corby story. Leslie: My son marries Candice’s daughter one day, and we become Grandmother sisters! Or that our kids grow up and become artists and do really fun surprising work. Candice: We switch hairstyles. We open a yoga/tae kwon do/knitting studio. What is the most misunderstood aspect of being a curator? Candice: Simultaneously being introverted and extroverted. That it involves being a high-end administrative assistant and an event planner. Leslie: I’m currently reading A Portrait of The Artist as a Young Girl, which is a collection of writings by Irish authors about their childhoods, edited by and based on interviews with John Quinn. Candice: Six different home decor magazines and Behind Closed Doors: At Home in Georgian England. Fill in the blanks: a stitch in ________ saves ________. Self/Fabricated is funding on USA Projects through June 1, 2012. 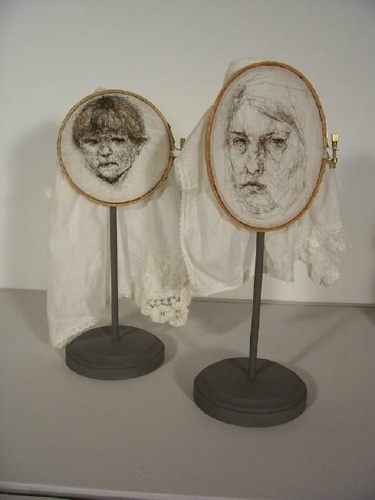 Images: still images from USA Projects video: Self/Fabricated, work by David Curcio, and work by Joetta Maue; Leslie Schomp, SELF PORTRAIT WITH SON (2007), hair and nylon thread on found handkerchiefs, embroidery hoops. I am very charmed and taken to a good place by the interview and the art. Stitch on.